How often do you open your fridge at “dinnertime,” stare into it, and then close the door in frustration? As much as you hope and pray, food won’t magically appear on your table, steaming hot, ready for your smiling family to sit down together. And in busy seasons, when you’re juggling kids’ school schedules, practices, chores, homework, and everything else, getting dinner on the table can seem impossible. I’ve tried weekly and monthly meal plans, and in different seasons, I use different menu planning techniques. However, in busy seasons, I’ve found that monthly meal planning is easiest. It takes less time to set up, maintain, and think about, especially when I’m already pushed to my limits. If you’ve been trying to plan your family’s dinner menu, here’s how to set up a monthly meal plan step-by-step! 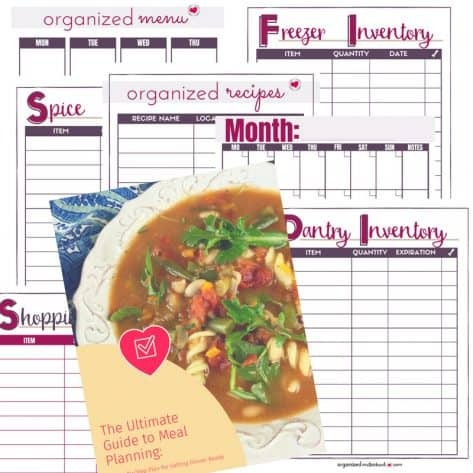 To set up your meal plan, you may want to start a meal planning binder. 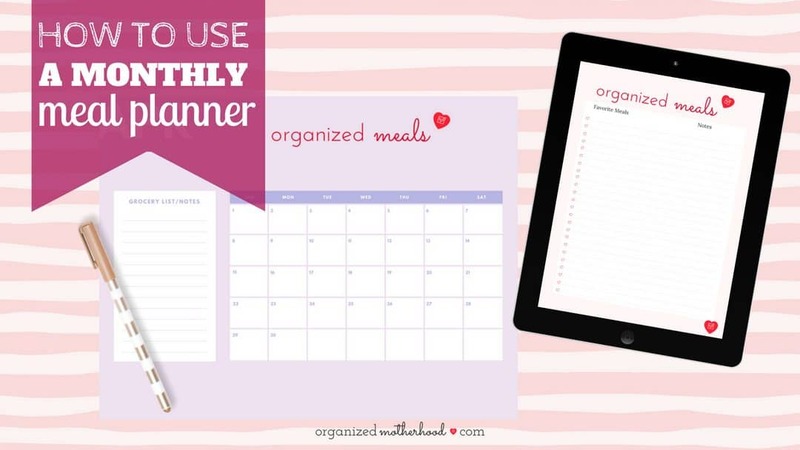 Include your monthly dinner menu, a list of your favorite recipes, recipe inspiration (I print out monthly dinner menus and ideas from MyFreezEasy), and a calendar. 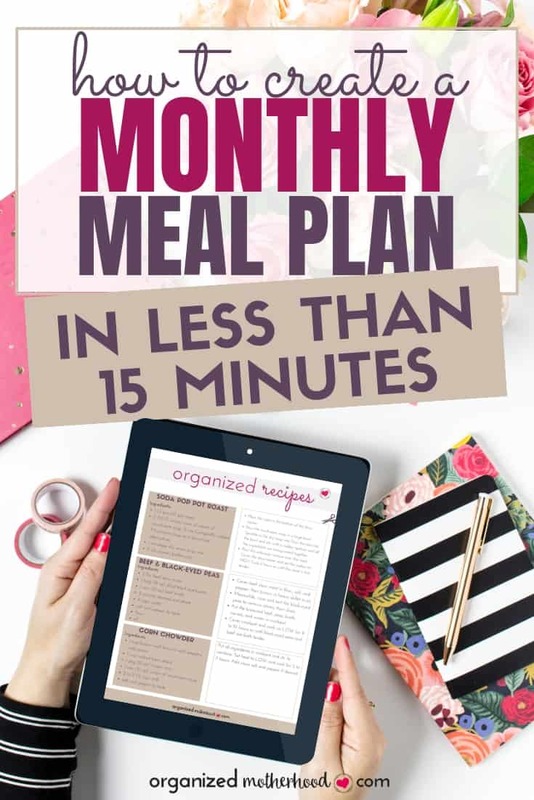 You can also use the Organized Motherhood Meal Planner to create your monthly meal plan, which includes pages for your favorite recipes, weekly and monthly calendars, and meal planning and prepping guides (use coupon code EASYMEALS to get 50% off). Before you even begin creating your meal plan, make a list of your family’s favorite recipes. Unless it’s a recipe that you know by heart, add the cookbook or recipe location next to the name of the recipe. As you’re making a list of your favorite recipes and go-to meals (or once you’ve brain dumped them onto a page in your meal planner), organize your list. One way to organize your favorite recipes is to organize them into categories. For example, make a list of your favorite Instant Pot recipes, 30-minute meals, Meatless Monday meals, etc. If you want to have one list of meals, either color code the recipes or make a note next to each recipe. If you don’t have enough “favorites” or you want to try some new recipes, you could also sign up for a monthly meal plan. I’m in love with MyFreezEasy, which has meal plans based on your preferred cooking method (I love the slow cooker and Instant Pot meal plans) as well as by type, like chicken recipes. Once you’re ready to start creating your meal plan, add any important dates, holidays, or events to your calendar. If you know that your family always plans a barbecue on Father’s Day or if you’re attending a wedding at the end of the month, write that on the calendar immediately. If you’re in a busy season and know you’ll be running several nights a week, highlight those days. You may even want to color code days when you do certain activities. On my calendar, I highlighted the nights that I had to take my son to baseball practice in yellow and the nights that I needed to make food for the farm in green. Depending on your family’s routine, you may want to designate certain days for different types of food. For example, Thursday might be leftover night and Friday is pizza night. If you don’t have a set schedule, plan your meals around your various activities. On nights when you need a quick meal, use your slow cooker. On nights when you have more time, plan to use your skillet or oven. You may even want to list a few last-minute meals in the notes section or margins of your meal planner. If you forget to thaw your meat or get home late, make a quick meal in the Instant Pot. Look for easy recipes and sort by type in the MyFreezEasy meal plan. Especially when you’re in survival mode, using a monthly meal plan can help you get organized. It’s one less thing to think about every day, you’ll guarantee that your family is eating better, and you’ll also make sure that you can get out the door for your evening activities! Once you’ve made a dinner menu for the month, save it and reuse it next month or even next year.